The attacks on U.S. government facilities in Benghazi took place five years ago. The federal trial for Libyan militia leader Ahmed Abu Khattala, the alleged mastermind behind the 2012 terror attacks on the U.S. government facilities in Benghazi, Libya, started this week, and U.S. Ambassador Chris Stevens’ bodyguard has testified. Diplomatic Security Special Agent Scott Wickland, the ambassador’s bodyguard and one of the survivors, said in his testimony this week that Stevens’ last words to him were: “When I die, you need to pick up my gun and keep fighting,” the Daily Mail reported. Stevens was one of four Americans to be killed during the attacks five years ago. 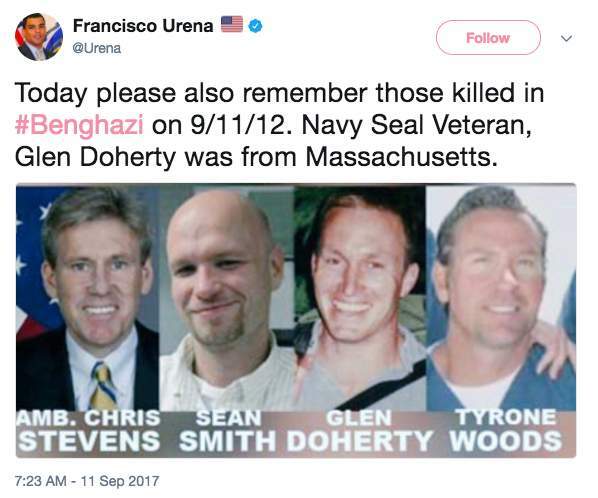 Also killed in the attacks were U.S. Foreign Service Information Management Officer Sean Smith; and CIA contractors and former Navy SEALs Tyrone Woods and Glen Doherty. Paronto is one of the survivors and heroes of the 2012 terror attacks on the U.S. government facilities in Benghazi, Libya, where he was part of the CIA security team there. He fought off terrorists for more than 13 hours and saved more than 20 lives. His account of the attack is told in the book “13 Hours,” and he has also penned the book “The Ranger Way.” He is a former U.S. Army Ranger from the 2nd Battalion, 75th Ranger Regiment. If convicted, Khattala faces a life sentence. He is on trial for 18 counts that include murder, attempted murder, material support of terrorism and destruction of U.S. facilities. While the trial is a “sideshow,” Wickland’s testimony is accurate, Paronto pointed out. As [Stevens’] bodyguard […], Wickland was the last person to see him and an aide alive as they tried to escape a burning mission villa. Wickland also was at the wheel of an armored car evacuating U.S. security personnel that ran a gauntlet of hostile fire to the CIA annex, only to have the attack trail them and mortar rounds kill two more Americans and wound one of Wickland’s close friends just feet away from him on a rooftop. On Sept. 11, 2012, at around 9:40 p.m. local time, a large number of armed men attacked the government compound in Benghazi. Stevens and Smith died from smoke inhalation, while Woods and Doherty were killed by two separate mortar rounds that hit their position at the CIA annex. A report released last year revealed that the Obama administration and then-Secretary of State Hillary Clinton failed to protect the American diplomats. The 800-page report revealed that in the months leading up to the attack, there was worsening security in Libya, poor bureaucratic leadership and inadequate resources. The report showed Clinton and the State Department’s inadequacy to protect the Libyan diplomatic outpost. The report also revealed that the CIA missed the threat and wrote faulty intelligence after the attack. Clinton told a U.S. House committee that she was aware of the dangers in Libya but “there was no actionable intelligence” indicating a planned terrorist attack. The report showed that intelligence was available, but Clinton and her top aide, Patrick Kennedy, failed to realize the risk of a potential attack. The 800 page report took more than 2 years to investigate and complete.